Adidas Rod Laver Vintage sneakers - Crossed Combs - retro stuff, rhythm and blues, tiki and all that jazz. 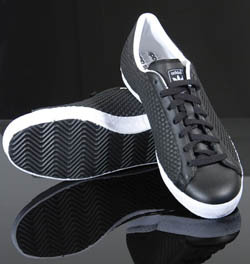 Adidas comes up with this stylish black leather basket weave version of the classic Rod Laver shoe. Perhaps not suitable for the tennis court but a rather suave shoe for everyday wear. Quality! You can pick them up online from the Cali website, priced at approx $128.